This is a little spicy and fresh sandwich...I use green chaat chutney as a spread ..Its really fresh and Flavorful . Boil the potato ,peel the skin and cut in to slices add pepper and salt to it and keep aside. Heat a griddle and toast the tawa light golden brown on both sides. 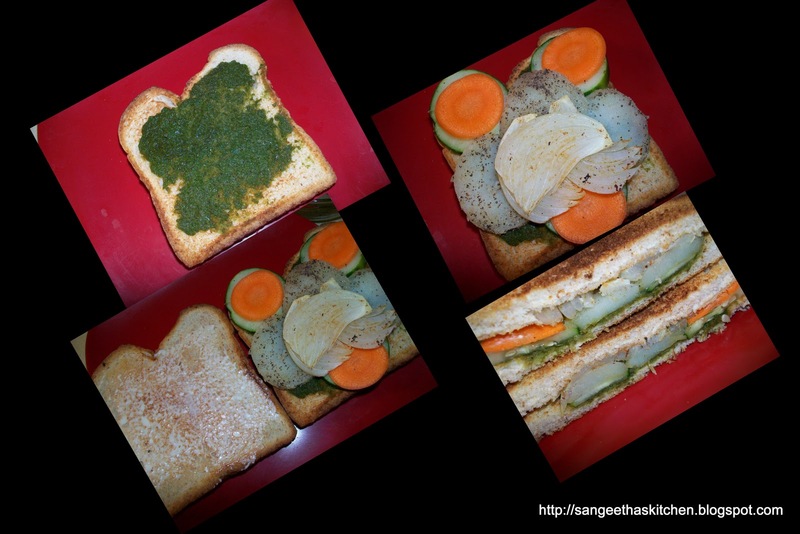 Transfer the bread slices to the serving plate,to one slice spread the green chutney,place salted and peppered potato slices,cucmber slices,carrot ,onion and bell pepper. Cover the vegs with another slice spread with mayonnaise or cheese. Thats it ...Ready to serve .